Claus von Stauffenberg, far left, and his intended target - Adolf Hitler. 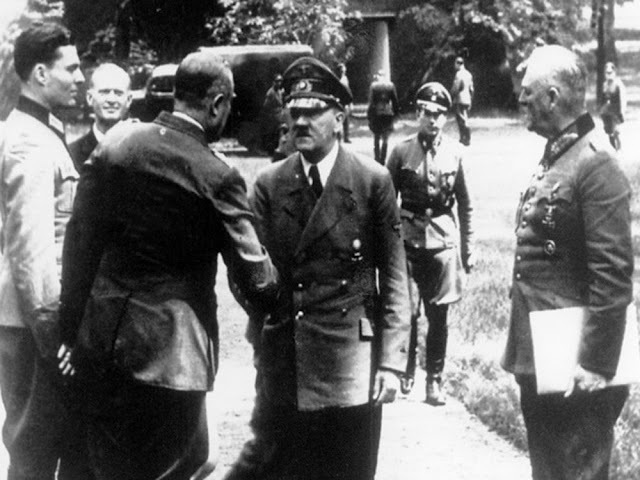 The famous July 1944 attempt to kill Adolf Hitler at his "Wolfsschanze" headquarters near Rastenburg (Ketrzyn) in East Prussia goes by various names: the 20 July Plot, the July 1944 Putsch, the Attentat, and Operation Valkyrie are terms often used to identify the event. "Valkyrie," used as the title of a 2008 Tom Cruise film about the event, actually refers to a standing operations plan issued to the Territorial Reserve Army of Germany to impose control following a general breakdown in civil order of the nation. Thus, it does not refer to the bomb plot itself, but rather to events contemplated for the aftermath. As everyone familiar with the basic course of World War II knows, the 20 July Bomb Plot failed. However, it came within a whisker succeeding. Many now view the attempt to assassinate Hitler as one of the shining moments for Germany of the entire war, so it is well worth reviewing. Let's take a look at the plot, its origination, and why it failed. 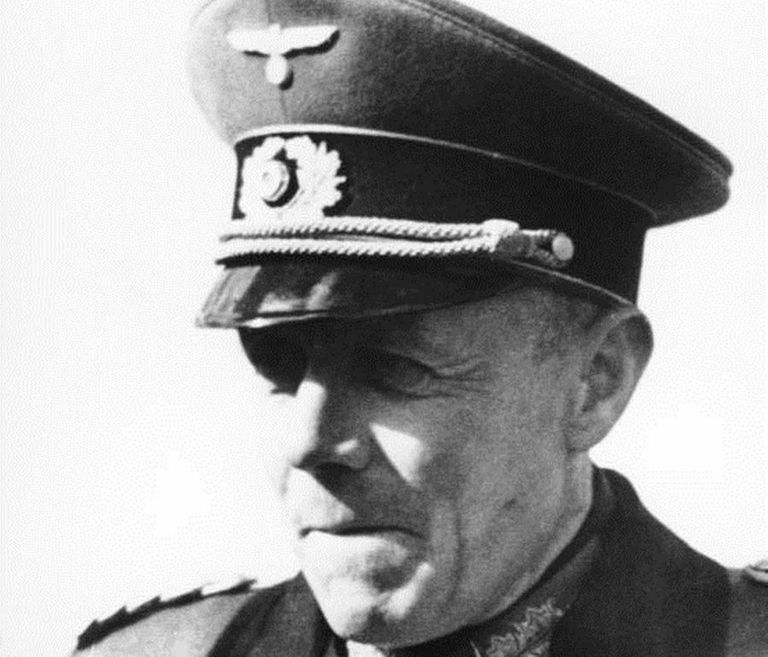 Colonel General Ludwig Beck, the godfather of the plots to kill Hitler. (Deutsches Bundesarchiv (German Federal Archive), Bild 183-C13564). Opposition to Hitler within the highest reaches of the Wehrmacht began well before the invasion of Poland on 1 September 1939. The Chief of the General Staff, Colonel General Ludwig Beck, deeply opposed Hitler's strategy of aggression and intimidation and engaged in various acts of defiance. For instance, he flatly refused to draw up plans for an invasion of Austria ("Fall Otto," or Case Otto), but later fell in line when he realized that Austria would not oppose the Anschluss. He also opposed the invasion of Czechoslovakia, writing several memoranda arguing that Germany was not yet strong enough to embark on any military campaigns. He went so far as to write a memo dated 29 July 1938 in which he argued that the Wehrmacht needed to prepare "for an internal conflict which need only take place in Berlin." This led to a 10 August 1938 meeting at which the other generals supported Hitler, so Beck resigned on 18 August 1938. From that point forward, he was at the heart of a conspiracy to replace Hitler. Carl Friedrich Goerdeler. Slated to be the new chancellor in a post-Hitler government, he instead was executed on 2 February 1945. After Beck's resignation, the anti-Hitler faction retreated into the shadows. Several different opponents to the regime gradually coalesced into a shadowy organization over time. 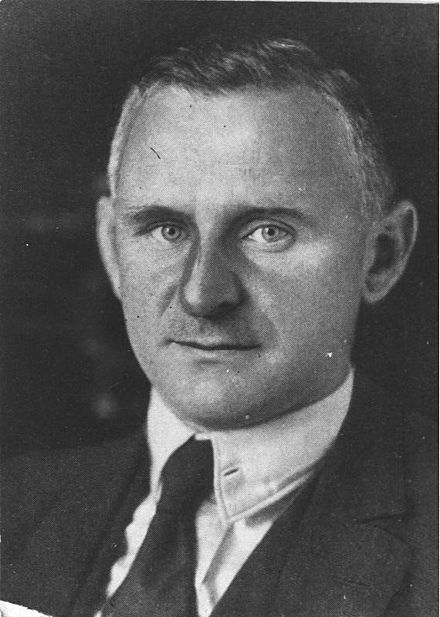 Reich Price Commissioner and former Oberbürgermeister (Mayor) of Leipzig Carl Friedrich Goerdeler, who knew Beck, added a host of other important names to the evolving conspiracy. These included Ulrich von Hassell, Admiral Wilhelm Canaris, Johannes Popitz and Chief of Staff of Army Group Center Henning von Tresckow. As the war progressed, many illustrious names were added to the roster, including senior military leaders such as Field Marshals Günther von Kluge and Erwin Rommel. One problem was that everyone had their own quibbles and requirements for action. Rommel, for instance, would only participate if Beck became the new national leader. Von Kluge famously replied to a request to participate, "Ja – wenn das Schwein tot wäre!" ("Yes – if the pig were dead!). The conspirators wanted Hitler dead, but they were not so eager to do the deed themselves. Conspirators made several feeble attempts to assassinate Hitler that came to nothing, and it became clear that they needed a man of action to actually pull it off. Lieutenant Colonel Claus Schenk Graf von Stauffenberg was a man of action. He had been badly injured in Tunisia on 7 April 1943 during a strafing attack by US P-40 Kittyhawk fighter-bombers and repatriated. The deteriorating course of the war convinced him that Hitler needed to be removed from power. 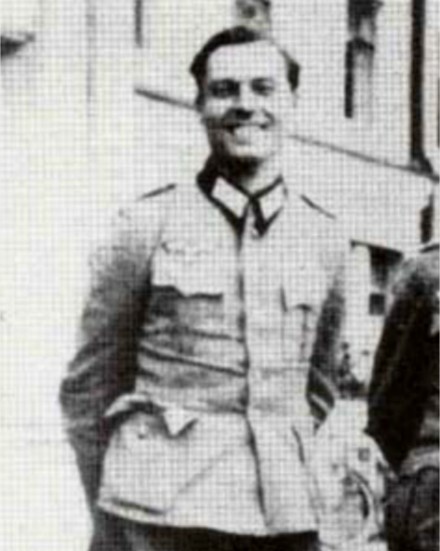 Conspirator General Friedrich Olbricht brought von Stauffenberg into the plot, and things immediately began to happen. Several attempts to kill Hitler were launched, but they all failed for one reason or another. For instance, Henning von Tresckow arranged to plant a bomb on Hitler's personal Focke-Wulf Fw 200 Condor that was designed to detonate once the plane reached cruising altitude - it simply failed to go off. Another time, an assassin was waiting for Hitler during a uniforms display at Schloss Klessheim near Salzburg, but Hitler sped through the event before the attempt could be made. In all, fifteen known assassination attempts were made against Hitler, but none came close to succeeding. Nobody seemed capable of actually pulling the trigger in Hitler's presence. 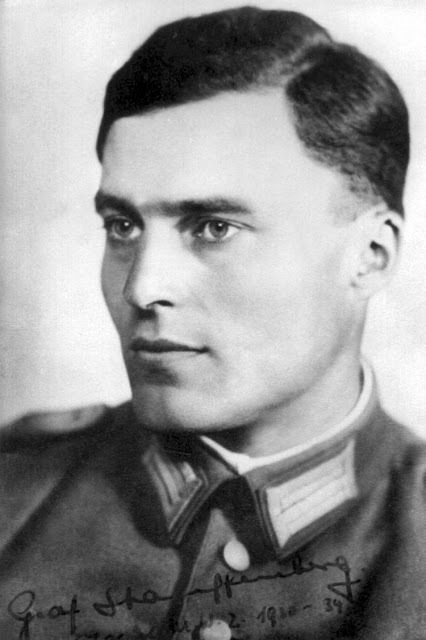 Claus von Stauffenberg originally intended to kill not only Adolf Hitler, but also Hermann Goering and Heinrich Himmler. 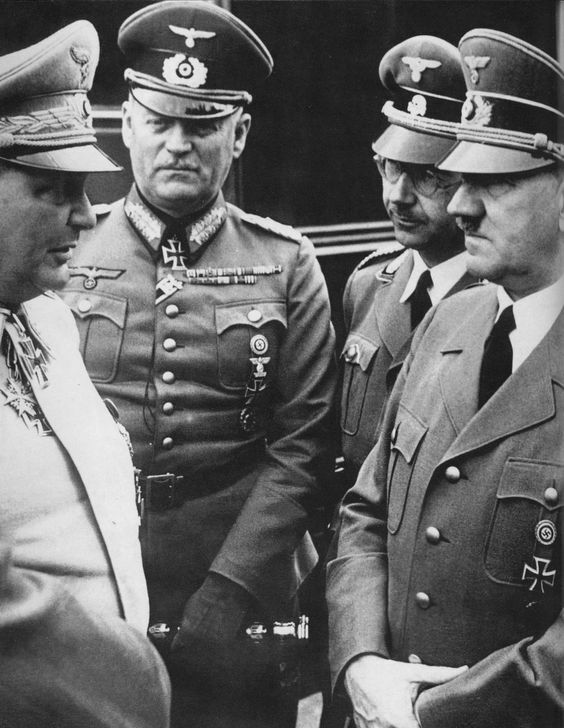 Here, Hitler is shown with Goering, Himmler, and chief of the Oberkommando der Wehrmacht (OKW) Field Marshal Wilhelm Keitel on Hitler's 20 April 1941 birthday. 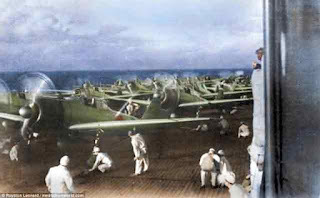 Time was passing without results, and Germany's military position was deteriorating rapidly. Von Stauffenberg finally realized that, if you wanted a job done right, you had to do it yourself. He had regular access to Hitler due to his position on the staff of the Ersatzheer ("Replacement Army"), a key part of Operation Valkyrie (which Hitler endorsed). Originally, von Stauffenberg also wanted to kill second-in-command Reichsmarschall Hermann Goering, Reichsfuehrer-SS Heinrich Himmler and Hitler at the same time, but the timing never jelled. Von Stauffenberg himself made an attempt at Berchtesgaden on 11 July 1944, but aborted the attempt at the last minute because Himmler was absent. 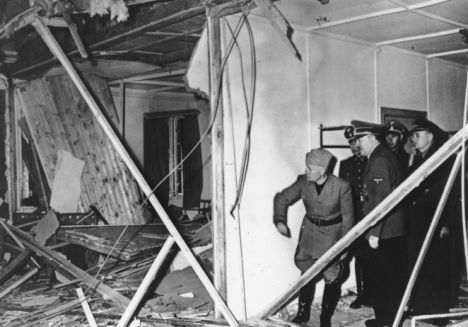 At last, von Stauffenberg decided to go through with the assassination attempt against Hitler regardless of whether Himmler and/or Goering also were present In the event, neither were. On 20 July 1944, von Stauffenberg attended a briefing at Hitler's East Prussian headquarters carrying two bombs hidden in his briefcase. Once again, something went awry - the briefing was moved at the last minute from the basement Führerbunker to Albert Speer's wooden barrack/hut because the Führerbunker had just been painted and it was a very hot day. This change would minimize the effect of the bombs' concussion, making the effect uncertain. Von Stauffenberg also was able to arm only one of the bombs, further weakening the effect. However, he was a man of action, and he decided once and for all to follow through. 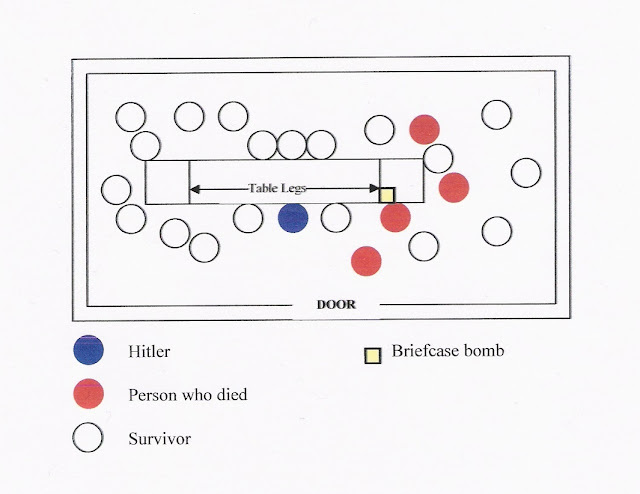 A diagram of the position of the bomb and the conference participants. Those who perished were on the wrong side of the solid-oak table leg. It shielded the intended target, Hitler. Von Stauffenberg entered the conference room as usual and placed the briefcase containing the armed bomb under the heavy wooden map table. He then left the room on the pretext of taking a phone call from Berlin. 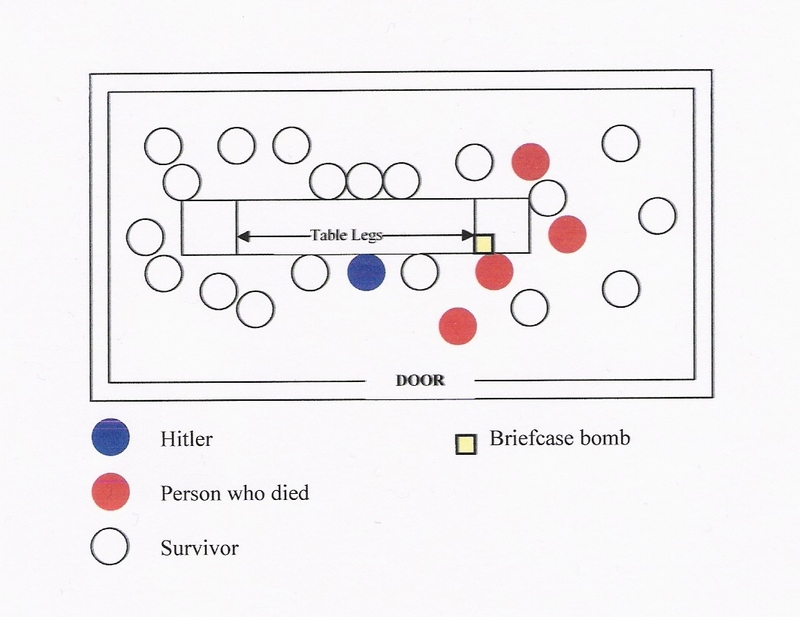 In his absence, one of the attendees, Colonel Heinz Brandt, moved the briefcase away from Hitler and behind one of the table supports. The bomb went off, killing four people and badly wounding several others - but Hitler miraculously survived with relatively light injuries. 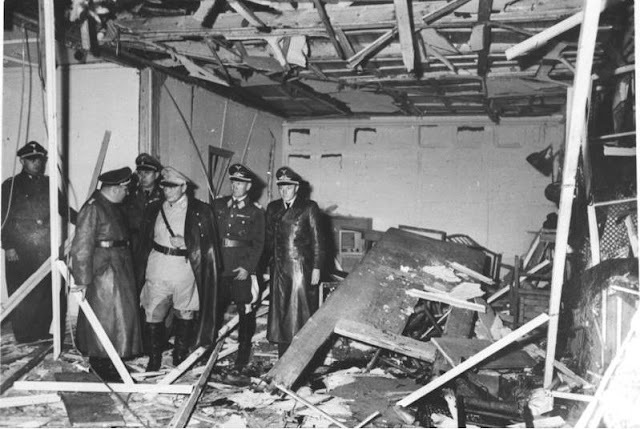 Hermann Goering rushed over to inspect the damage. Out of communications while flying back to Berlin, von Stauffenberg did not realize that Hitler had survived the bomb blast. He quickly drove to the Bendlerstrasse where he had his headquarters to organize the follow-up to the assassination. A poorly conceived plan to take over the reins of power was placed in motion emanating from the Bendlerstrasse offices. A few half-hearted moves were made to seize power, notably in Paris by Military Governor of France General of the Infantry Carl-Heinrich von Stülpnagel. Hitler, however, quickly phoned Propaganda Minister Joseph Goebbels, who went on the radio and broadcast news of the assassination attempt - including the key fact that Hitler had survived. Co-conspirator General Friedrich Fromm, Commander-in-Chief of the Replacement Army and present in the Bendlerblock (Headquarters of the Army), then quickly changed sides. He had his men take the Stauffenberg and the rest into custody after a brief struggle. 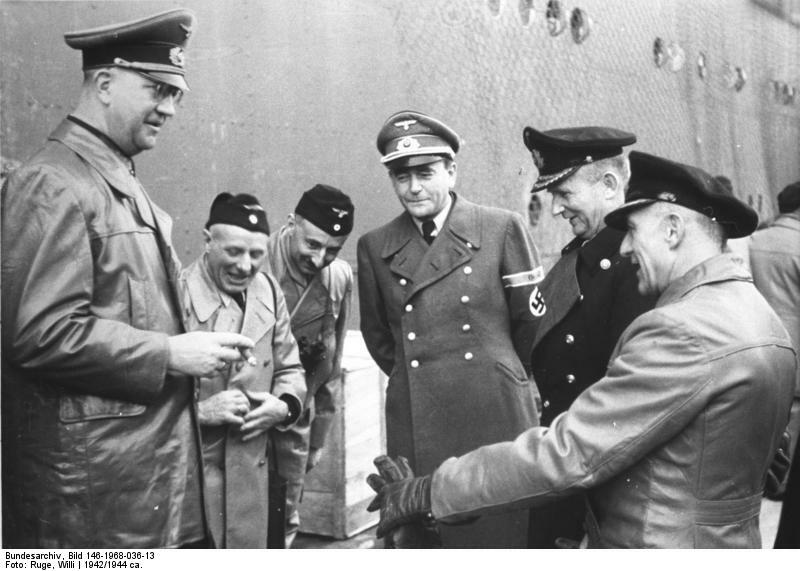 From left to right: General Fromm, two navy NCOs, Minister of Armaments Albert Speer (suspected of being among the conspirators, but cleared), Hitler's successor Admiral Karl Doenitz, and captain Kehrl, head of Planning Dept, Ministry of Armaments. (Will Ruge, Federal Archive). To cover up his own complicity, General Fromm had his soldiers summarily execute Stauffenberg and his co-conspirators in the building's courtyard that evening. Fromm's change of heart ultimately did not save him - he was exposed and executed - but after that, Hitler was more firmly in power than ever. He immediately instituted a purge that claimed the lives of Beck (who shot himself under duress), Rommel (took poison at home under duress), von Kluge (took poison while flying back to Berlin to face certain arrest), and many others. 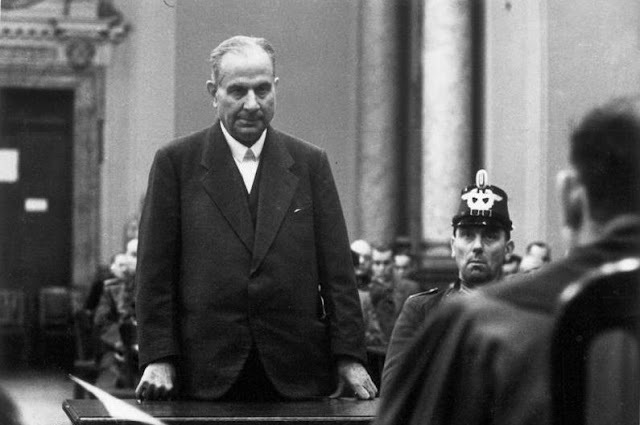 One of the minor conspirators, farmer and agricultural contractor Carl Wentzel, appears before the "People's Court" headed by Roland Freisler (partially visible) during the aftermath of the 20 July Bomb Plot. Wentzel was executed on 20 December 1944 (Bundesarchiv, Bild 151-53-30A / CC-BY-SA 3.0). Hitler sent his shredded clothes home to sweetheart Eva Braun at the Berghof. Why he did so is unclear, but US Army soldiers found them in her trunk there after the war. The photos show a few things that might not be obvious without close inspection. 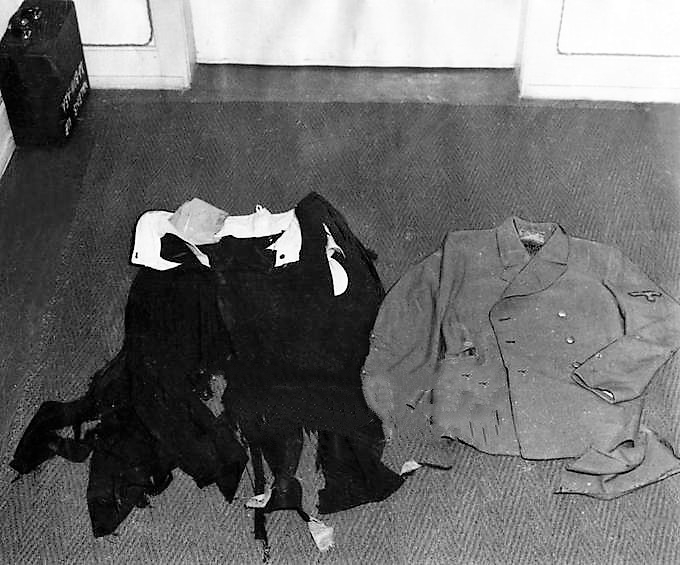 For instance, there is blood on Hitler's jacket which is difficult to make out in the black-and-white photographs - it is the four little vertical stripes at the bottom. Whether it is Hitler's blood, or that of a person near him, is uncertain - but the US Army men who retrieved the items thought it was his. 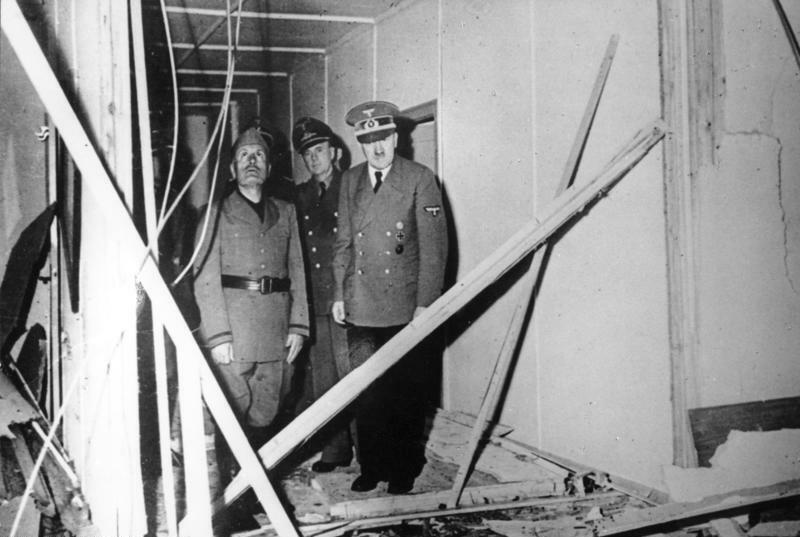 It is apparent from the condition of Hitler's clothes that the bomb did indeed detonate as expected under the conference table. 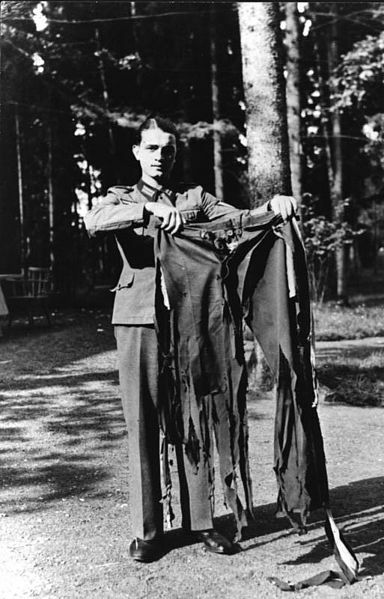 They show that Hitler's legs took the full force of the explosion, but his torso was spared. 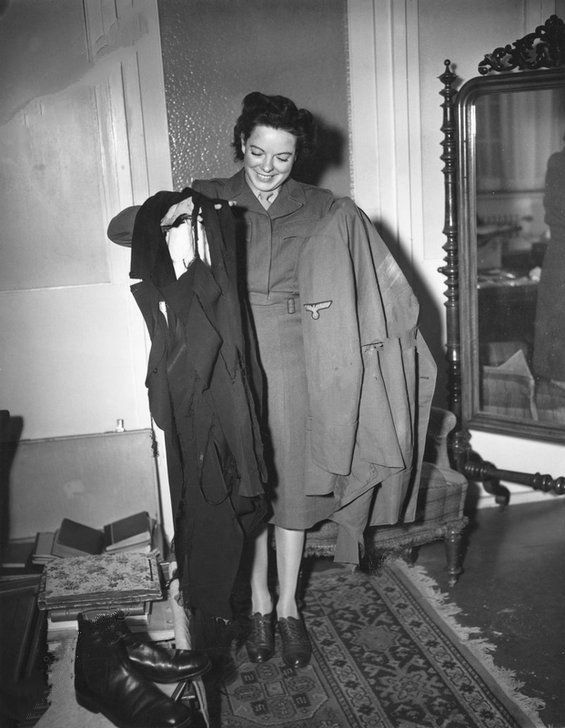 A member of the US Army with Hitler's clothes and shoes that he was wearing during the 20 July Bomb Plot. The intervening table support leg and the solid oak tabletop absorbed and deflected just enough of the blast to save Hitler's life. Acting as if the assassination attempt had been nothing but a nuisance, Hitler kept his appointment to greet Mussolini at the train station shortly afterwards. How Hitler was able to stand immediately afterwards is a mystery, but he was on his feet literally within minutes as shown in newsreel footage. He must have been in great pain, but he did not show any of it and appeared positively cheerful. Hitler and Mussolini inspect the damage only hours later. Mussolini's interpreter Dr. Paul Schmidt stands behind the two leaders (Bundesarchiv, Bild 146-1970-097-76 / CC-BY-SA). 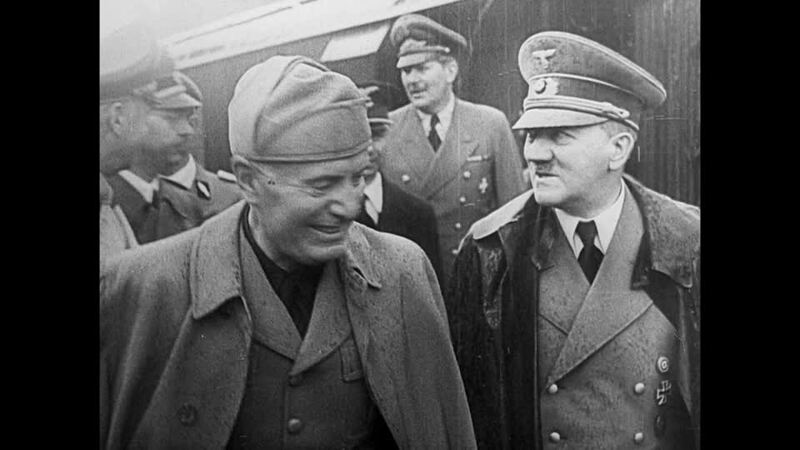 Hitler gave Mussolini a personal tour of the blast site. Hitler and Mussolini view the wreckage. As Mussolini sped away in his train afterward, he is said to have muttered to an aide, "Now we are not alone in betrayals." 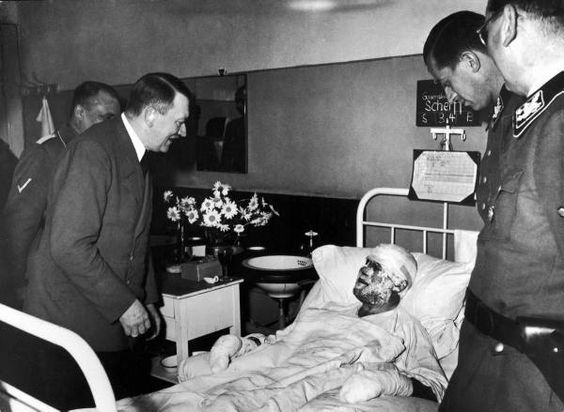 Hitler visited some of the badly injured men from the bomb blast later at the hospital. Speculation overseas was that Hitler might not have survived the blast at all, or was badly injured and succumbed soon after from his injuries. It is known that Hitler had doubles - a deceased double was left outside the Berlin Chancellery bunker in May 1945 for purposes unknown (there is a lot of speculation why the Germans would do that). However, the rapidity with which Hitler reappeared in public for the newsreels seems to refute the idea that Hitler perished in the explosion and was replaced as a figurehead by someone else. Many now view the 20 July Bomb Plot as salvaging some honor for both Germany and the military.